There have not been many anglers more consistent through the winter than Kevin Peacock. So it was perhaps fitting that he topped the last match in the Webb’s AC winter series fished at Kingsland Fishery on Sunday. Drawn on peg seven, Peacock alternated between the pole and feeder fishing both pellet and cat meat to win with 54lb 1oz. Vince Hull on peg 16 was a close second with 53lb 5oz, all caught on the feeder with pellet. Third was Martin Parker, who also caught on the feeder fishing white pellet on the hook to record a level 50lb. This weekend the club are back at Kingsland on the small carp lake for the first match of the summer series and it looks like its going to be a hard battle to come out on top in this one with some very capable anglers now regularly fishing with the club. 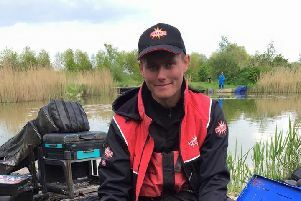 Deeping St James held their last match of their winter series, which included the final of the Deeping Individual League and also the Non Cup Winners Cup, on the club’s Horseshoe Lake near Wansford. The matchwinner from peg 40 was Phil Price, who used a Method feeder baited with a hair rigged pop-up pellet close to the far bank to take carp to 12lb for a total weight of 69lb 5oz. This also gave him the trophy. Second from peg 38 was Tony Johnson. He fished a long pole line using worm on the hook over a bed of chopped worm and casters to put 59lb 5oz on the scales. Nigel Collis came third with 35lb 2oz of carp and bream from peg 19 fishing the pole and feeder. The individual league was won by Graham Wright with 36 points. Second was Ray Torrington with 31 points and third was Jason Chatham on 28 points.